Tato Martino selected his expected side for this match: his ‘big game’ shape with Cesc Fabregas in midfield, Andres Iniesta out on the left and Neymar on the right. Gerard Pique didn’t last the first half, and was replaced by Marc Bartra. Diego Simeone also named his expected side, and Atletico also suffered from an injury. Diego Costa was doubtful before the game and pulled up midway through the first half. He was replaced by Brazilian playmaker Diego, who played behind David Villa. The first half was slow and cautious, the second much more intense – but the overriding feeling was that these two sides knew each other too well, and the tactical battle was rather familiar. It was more notable for minor points of interest, rather than the overall pattern – which was entirely as expected. Barcelona’s best method of getting in behind the Atletico defence was by switching the play out to Daniel Alves on the right, who was making his typical late runs in behind the defence to cross. Alves seems rejuvenated this year after a quiet 18 months, which is useful for Brazil ahead of the World Cup. These days, Alves and Jordi Alba play roughly the same role at Barcelona, and therefore theoretically there should have been overlapping on both sides. But whereas Iniesta tended to drift inside and left to go free by right-back Juanfran, Filipe Luis was more concerned by Neymar’s movement and tracked him closer, therefore opening up space for Alves. The Brazilian had four separate opportunities to cross the ball – and, to be frank, the delivery wasn’t great. It didn’t help that he had no far-post target, nor that Neymar had started on his side and therefore wasn’t in a position to get on the end of the ball. Messi was often the only option, but Alves often played the wrong type of pass – a chip instead of drive, or vice-versa. Victor Valdes’ long-term injury means Jose Pinto will have to be Barca’s keeper for the remainder of the season – and, if their transfer ban is upheld, for next season too. This wasn’t a promising outing for the perennial back-up, and not primarily because of his shotstopping skills. His distribution was awful, and on various occasions Atletico caused problems by shutting him down, or by pressing the defenders and waiting for him to misplace a pass. In fact, it resulted in a couple of Atletico’s best opportunities. 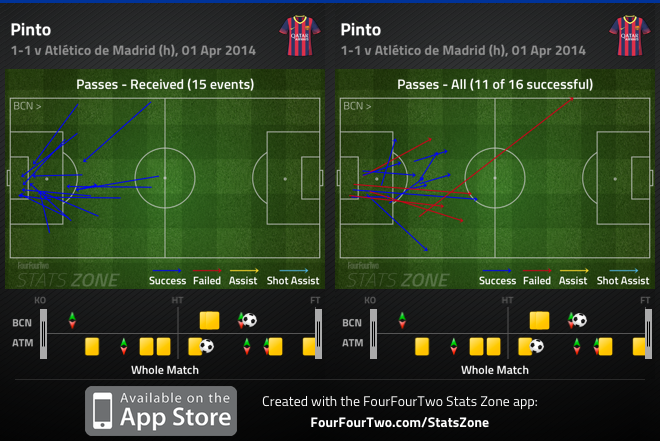 Another tactic, in the opening stages, was Atletico’s use of long balls. Neither Costa nor Villa are particularly adept in the air – although Costa will fight for anything – and it might have been a tactic designed to prevent Barca’s pressing causing problems. As the game wore on, Atletico’s main approach was simple – pressing when the ball was played into Barca’s attacking players, getting men around the ball and then breaking quickly. Some of their initial passes in the transition were good, but Barca’s pressing was more intense than usual and crowded out the moves effectively. Atletico’s players’ attempts to burst past this were often unsuccessful, with neither Koke or Arda Turan at their best. Barcelona came into the game at 1-0 down – thanks to Diego’s superb long-range strike – immediately after Martino switched to a ‘proper’ 4-3-3. They were now using three forwards spread across the pitch, with Iniesta back in his favoured central midfield position. This is the formation many believe Barcelona are still more suited to, and there’s a consistent problem with selecting Cesc Fabregas for big games like these – it’s almost counter-productive. On paper, it makes perfect sense to include an extra midfielder to ensure dominance in big matches. It was an approach Pep Guardiola used consistently, often including Seydou Keita in the left-of-centre midfield position and pushing Iniesta wide. The problem with Fabregas, however, is that he’s suited for the exact opposite type of match. His anarchic, English-style play (at least compared to the other midfielders) is most useful in games against relative minnows, where Barca are dominating possession against a parked bus, and find the use of another midfield runner very useful. He doesn’t quite fit into Barca’s pretty passing patterns, but is more of a goalscoring threat than any other midfielder. In the big games, though, is doesn’t make sense to include a player like this. Big games often bypass Fabregas, and when the tempo of matches is high, he’s not actually particularly effective despite being that type of player himself. Everyone is forced to play a high tempo, and Fabregas’ USP has gone. Equally problematic is the fact it changes the position of others. Iniesta can be useful on the left but plainly prefers not to play there, while Neymar isn’t anywhere near effective on the right as on the left. Barcelona’s equaliser summed it up – it was a ‘classic’ Barcelona goal featuring a through-ball and a finish from a wide forward, Iniesta to Neymar. Before the change, Iniesta wouldn’t have been in that position to play the pass, nor would Neymar have been there to finish – he’d switched to the left after Alexis Sanchez’s introduction. Barcelona really should have won the game final 20 minutes – they had constant pressure with Iniesta playing superbly in his midfield role. Atletico offered no outlet for the counter-attack, but the defenders (and Thibaut Courtois) made some excellent last-ditch blocks. The latest instalment in an ongoing series between two entirely different sides, neither of whom significantly varied their approach for this game. Martino probably has more questions after this match – particularly whether he should continue using Fabregas in this role for big matches, or whether playing a straightforward 4-3-3 makes more sense. Simeone will simply hope Costa is back for the second leg, and that Atletico take their chances. Yes fabregas is ineffective in such games. There’s no way Messi or Neymar would have scored via Alves’s cross, that too against Atletico Madrid. It’s a foolish way IMO (to try and cross the ball and think it’s a plan b). 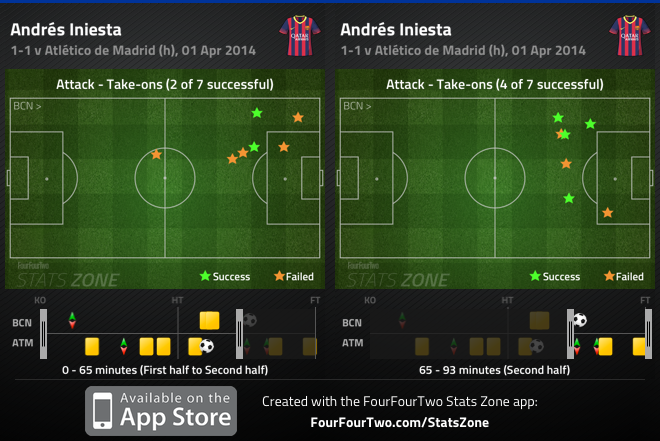 Iniesta is also brilliant in RECOVERING the ball. He can do so if he plays in the center of the field. (Iniesta nicks the ball from Milan in the central position to assist Messi for the second goal in the 4-0 victory vs milan).. In the second leg, I’d like to see Neymar on the left and Sanchez on the right.. Messi doesn’t track back and Neymar fails miserably in doing so.. We all saw how Di Maria utilized this fact, so Neymar in the right is not preferable if we do not want to concede. 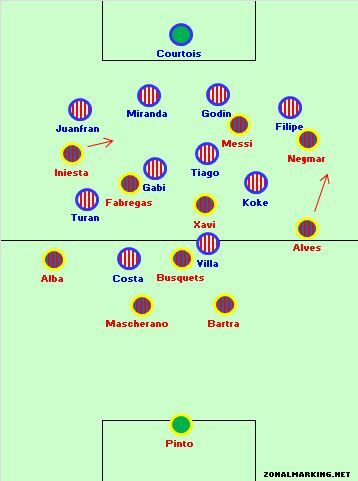 Btw ZonalMarking, does a Pure striker ahead of Messi will be a good tactics against Atletico Madrid?. Also I disagree with the your point that Cesc is a goal scoring threat than other midfielders. He misses hell lot of chances if played as a false 9..
Ale z was chuje. Zawsze dajecie analizę kontrowersyjnych spotkań. Sztandarowe ustawienie zespołu na przestrzeni całego sezonu macie już w dupie. Po chuja taka strona? I hope Martino will wake up and bench Fabregas for the return and maybe Neymar too. They were by far the worst players in the first game. They both got similar problems in tracking opponents and in being effective in a small space. Tata should start with Pedro and Sanchez upfront beside Messi those two work hard, track their opponents and they tire the backline of the opposite site. Neymar should come in in the second half when there is more room to play. I posted the following on another blog about the Cesc conundrum. What do you think Micheal? We need to remember why the 4 man midfield started getting consideration for the tough Barca games. The famed Xavi-Iniesta-Busquets was being overrun consistently in such games last season (Bayern, Madrid and few brave spanish sides). “Common guys! Enough with the Cesc bashing. You all are smart Barca fans. We know the games when we need the 4 man midfield, this wasn’t one of those games (at least after Costa went out) and Tata probably predicted wrongly how the game would go. Cesc quality doesn’t shine through in these kind of games obviously. But it wasn’t that long when we generally agreed our holy trinity midfield (Busq-Xav-Ini) can’t hold the fort alone in extremely tough games where game dominance can be challenged. The 4 man midfield has helped improved our work-rate in such games so far. Fabregas represents a huge conundrum for barca. He is clearly the heir apparent for when Xavi eventually retires because they are essentially the same player- slight in frame and lacking any outstanding physical qualities whether it be pace or strength, but it’s their perceptive qualities the intuitiveness to be able to control matches and do exactly the right thing at the right time whether it be delaying a pass or holding the ball up and buying a runner just enough time to spring the pass. However, it seems that since fabregas’s switch to the nou camp he has been forced to reinvent himself into something he is not and somewhere barca clearly don’t need. If we cast our minds back to his arsenal days and particularly the latter years where he was pretty much running the show all by himself with Nasri and rosicky and wilshere etc in support he was an exceptional player who could create a chance from anywhere on the pitch and added goals to his game to become the complete article. He was at the heart of everything great about Arsenal’s slick passing football. I argue that he has regressed as a player based on the absurd decision to play him as a false 9 and attempting to fit him into the team wherever it may be because his too good a player to leave on the bench for too long. Barca don’t need a scoring midfielder, they play with ‘forwards’ such as Neymar, Sanchez and Pedro rather than proper wingers on the flanks and have Messi who creates as well as scores. There’s no need to have s player like Fabregas making lampardian runs into the box from midfield or as a false 9 he is clearly not a centre forward. He has only gotten by and given the illusion that he is at least not a complete abomination in that role because of the quality of player he is and the improvement in his finishing that complements his exceptional touch and vision. I think Xavi needs to take a backseat role form next season onwards and Fabregas has to reintegrate himself into the barca setup as the string puller in midfield because he is clearly the future replacement.